Last Sunday, was a day for shoe lovers! oh no that's not me. 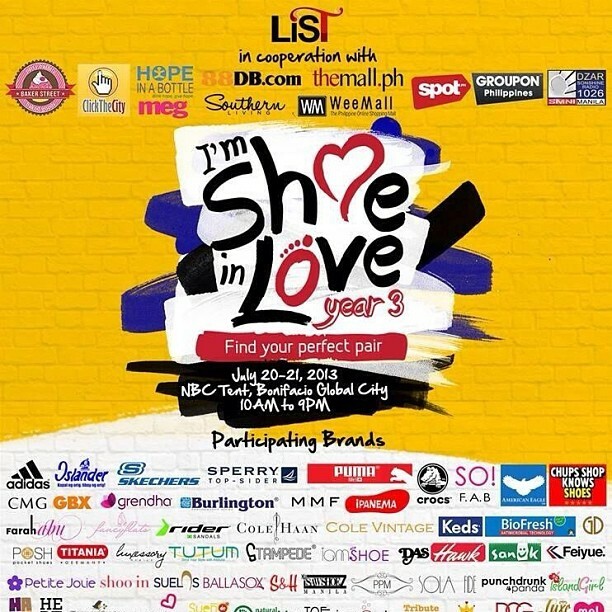 (wink*) hehe Famous shoe brands and online shops had the event which they got together for a shoe bazaar. It's called "Im shoeinlove" This is already on their 3rd installment, year 3. I got the chance to go the previous ones and yes! It's definitely an event that you won't miss. Brands like cmg,crocs,keds,vnc are all on sale! prices were dropped up to 70% off! what a great deal! Online shops were also on their huge sale! which re only offered on the event, excited? For now,I'll just walk you through my outfit for the day. Again and again, wore comfortable ensemble for a bazaar. We need to get those feet walking and running through those bargains! A flowy teal maxi skirt paired with a cutout stripes cropped top was my pick. And here we are! at the I'm shoe in love bazaar. This was held at the NBC tent at the fort last July 20 and 21,2013. Naleigh shop. I remember when I was just starting blogging,Ms. Justine the owner, was the first ones who trusted my blog for a sponsorship. and until now. Thank you so much!! luv yah! I'm glad I can get to see their new collection. They were all so fabulous! I tried them on too! oh so comfortable,Naleigh never fails me in terms with comfort,style and trend. Like them on facebook HERE! I discovered Mia Casa last super sale bazaar.I visited them again this time,going back for a necklace me and my sister liked! the quality might not be okay,but nooo! the quality is superb. Honestly,I thought the necklaces will tarnish if you use it for some time,but this ones didn't! So happy for the purchases! Trunk show..every shopaholic near trinoma mall in Quezon city will know them. They have stylish shoes and bags to die for! and this time they are offering it on sale! Look at those ankle strap heels its for 399 pesos only,awesome right? Trunk show can be checked HERE. happy shopping guys! During events, I never fail to visit them. They have this gorgeous bustiers that will really flaunt those curves! plus those girly and adorable dresses! Can't wait to blog about it soon! Thank you! Like them on facebook HERE for more girly,sweet,stylish and into the trend clothes! Pill. this is one shoe store that is always up to the trend.They have styles and designs that is so "in" plus their price is affordable too! shoes were on sale that time for as low as 350 pesos only! My first purchase with Sewn was at the greenhills tiangge. I can say their shoes are durable and pretty! I got my pair a few months back,but it's still good as new,though I used it for several times already. I love the pair I got from them,will surely make another one soon.Sewn can be seen HERE. Visit them guys! Tutum, this store offfered sandals and shoes that are so unique and fab. If you're like the kind of gal who wants to make a statement in your look,Tutum is highly recommended! They can be visited HERE. see those boxes? haha those are dozens of crocs shoes! pool of shoes are all there! S and H is also incredible! look at those spikes heels and wedges? Are you kidding me? really? It's for 1500 pesos only?! Shoot! this is a bargain. Not to frate,you can still get them at selected SM department stores. Tonic.Bargained their loots for as low as 350 pesos. I hoarded my pairs because they only offer sales on bazaars. haha addict much?! So till next Tonic! I really liked the shoes I'm wearing now on this event. super stylish ans comfy!! Have a glance with them HERE. and that's it..my latest best loots,best buys and bargains! Till next bazaar guys! I SUPER LOVE THE MAXI SKIRT!! and how you style it. Hope you can help me, I am only 5 in height, is it okay to wear maxi skirt like this? Been wanting to wear one but I'm having second thoughts eh.